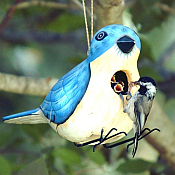 The Bobbo Collection is made up of "For The Birds' whimsical and distinctive birdhouses, birdfeeders, windchimes, and 'Weather Or Not' Thermometers. All products are meticulously handcrafted out of eco-friendly, fast growth, renewable Albesia wood. The paints and finishes used are non-toxic, and the thermometers are mercury-free. The quality of these hand carved, hand painted creations is obvious at first glance. All of these handmade products make wonderful gifts for any occasion!